How intelligent video is making hundreds of thousands of surveillance cameras effective. When it comes to solving the London bombing case and tracking down its perpetrators, the focus has tended to be on the thousands of cameras in London and their ability to catch everything on video. However, what security purchasers are starting to realize is that thousands of hours of video are only useful if you’ve got an enormous staff or the technical capabilities to analyze that footage. This is what the leaders in security are striving for -- not just adding more and more cameras to their systems but developing systems that make their cameras more and more useful. Spurred on by recent terrorist attacks and attempted attacks, federal and municipal governments, and private sector businesses all over the world are funneling more and more funds into their security budgets. From <?xml:namespace prefix = st1 ns = "urn:schemas-microsoft-com:office:smarttags" />Paris, France to the Paris hotel in Las Vegas, millions of dollars are being spent on security and, in particular, on cameras and Digital Video Recorders (DVRs). News articles point time and again to the number of cameras in London and the sophistication of that city’s security system as crucial to solving the London bombing case and tracking down its perpetrators. France’s Interior Minister Michele Alliot-Marie told Le Monde newspaper recently that her country plans to triple its surveillance camera count by 2009, and add new technologies to the system as well. Alliot-Marie cited the undeveloped nature of France’s surveillance system as a major problem in light of increased violence and recent terrorist attacks in Europe. “The latest attacks in London were prevented thanks to their video surveillance system, (which is) 10 times more developed than ours,” she told Le Monde. Alliot-Marie’s reference to the sophistication of London’s system points to a new direction in security. While the focus has tended to be on the thousands of cameras in London and their ability to catch everything on video, what security purchasers are starting to realize is that thousands of hours of video are only useful if you’ve got an enormous staff or the technical capabilities to analyze that footage. This is what the leaders in security are striving for -- not just adding more and more cameras to their systems but developing systems that make their cameras more and more useful. In Las Vegas, city officials signed a US$554,000 contract with Motorola to install surveillance cameras along the Strip. As with several other municipal surveillance systems throughout the U.S., the money for the Vegas system is coming from a Department of Homeland Security Grant. The Department of Homeland Security is spending millions of dollars every year to bolster the surveillance systems of American cities, and the sudden increase in cameras has sparked privacy concerns throughout the country. In order to justify both the expense and the invasiveness of these systems, officials need to ensure that they are effective. And to make cameras and recorders effective, security managers are looking to emerging technologies and analytics that make both elements smarter. Technologies borrowed from various other industries are fast becoming the security industry’s greatest tool. Imagine, for example, how utterly useless the billions of pages of the Internet would be without search engines to sort through them. Finding a particular person in thousands of hours of video is equally as improbable. Now, the same simple algorithms that allow people to search for and find the information they need on the web is being applied to security video, enabling users to search for and find specific people, objects, and events in minutes. In addition to making the jobs of law enforcement easier, these new technologies are already increasing security in some cities, and helping to justify both the existence and the cost of all those new security cameras. In Chicago, for example, where smart cameras and video analytics have been tested in various pilot deployments, the crime rate has been reduced significantly. Over the last few years, the Chicago Police Department (CPD) has set up more than 500 cameras throughout the city, and the CPD claims that surveillance has been an important crime-fighting tool, resulting in more than 1,200 arrests since February 2006. Although video analytics were initially trumpeted as prevention tools, and they can be effective preventative measures in certain circumstances, they have proven to be extremely useful to investigators. With the majority of police and security staffs spread thin, security managers and government officials are always on the lookout for tools and systems that maximize their forces and help solve cases quickly and accurately. Furthermore, despite an increase in security budgets fueled by the DHS, managers are constantly being asked to do more with less where security is concerned. Streamlining the investigative process helps accomplish exactly that. A new breed of surveillance systems, known as “Intelligent video management systems” are equipped with a whole host of features geared towards making investigators more effective in less time. With legacy DVR systems, an investigation could take up to several days as the investigator tracks down events across various systems, waits for video to download, sits through hour after hour of video, and tries to pinpoint the best images and video to support their case. With the new, more intelligent systems, the process is streamlined through simple search capabilities, and investigators can cut the time required to conduct the average investigation by up to 66 percent. In addition to the time required to sort through and find relevant video, investigators traditionally had to keep their case notes either in a paper file, or in a separate software system, on a different computer. This system was not only time consuming, it made it difficult for investigators to share information with other investigators or other departments. Few traditional DVRs are equipped with integrated enterprise case management, but it’s a common feature on intelligent video management systems. Integrated case management systems enable investigators to search and save information in the same system and, thanks to the use of enterprise platform technology, investigators working with intelligent video management systems can also easily share information with other investigators or other law enforcement offices, which strengthens their ability to prevent future security incidents. 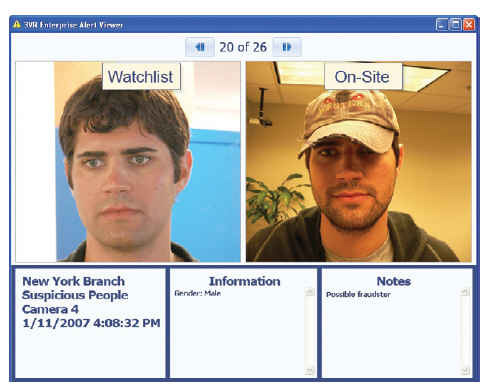 Users can even add suspects to watchlists and set alerts tied to those suspects that will trigger if any of them is caught on any camera connected to the system, even with cameras that are geographically spread across the country. Though it may seem on the surface to be an irrelevant element of a security system, storage is hugely important to the efficacy of any surveillance system. Most DVRs gradually degrade stored video, dropping frames arbitrarily until video eventually disappears after about 30 days. This process, called “pruning”, can be hugely problematic in an investigative scenario. Today’s smarter surveillance systems, however, are taking a new approach to pruning and putting control in the hands of the security manager. System administrators can set these new systems to keep and store key images, such as faces, for example, for up to two years. This small feature can be hugely important to a criminal investigation down the line, and also allows users to optimize their investment in video storage. Tech-savvy engineers at surveillance video companies are also starting to consider storage long before video is recorded. Today’s systems are designed to begin maximizing storage from the beginning by organizing footage and optimizing images as it comes in. These systems can recognize what is important and what is dead space, using simple motion and face algorithms, and store only relevant footage. After all, if you’ve only got a few hundred gigabytes of storage, who wants to waste them on footage of an empty street with no activity? Being able to gather all the evidence necessary to convict a suspect is hugely important in any case, not just to satisfy management and close the case, but to help a city or country build a reputation as a difficult target. If criminals are caught easily and prosecuted quickly, they are less likely to return to the same target and they may also warn other would-be criminals to steer clear of that target as well. Critics often point to the fact that while intelligent cameras and systems may help solve cases after the fact, they don’t do anything to prevent crime. However, in time these systems may well increase their ability to prevent crime before it happens. As more and more criminals are arrested and prosecuted with surveillance footage, more would-be criminals might think twice about perpetrating crimes because the fear of getting caught is greater. In the meantime, solving more cases, particularly violent crime and terrorism cases, is worth the expense of surveillance systems to most police departments. And the increasing intelligence of various video technologies may actually quell privacy concerns as well. With a smart camera that is watching only for known suspects and suspicious behavior, the old “you’ve got nothing to fear if you’ve got nothing to hide” excuse may actually be applicable. In addition to tracking suspects to solve specific cases, as surveillance systems get smarter, they also enable more collaboration between investigators, both within a country and between countries. Companies are working to connect systems to regional and international alert systems in order to quickly get the word out when a criminal is caught, particularly a suspected terrorist. Suspect photos are shared immediately, and law enforcement agencies are put on the lookout for suspects, armed with all of the information and evidence they need. Surveillance systems, of course, are not only used in government installations. More and more retailers, banks, and other private sector businesses are installing surveillance systems as well and it’s equally important that these systems be effective and capable of sharing information with local law enforcement. In the banking world, for example, check fraud has become an increasingly popular way for terrorist groups to fund their operations, and if the statistics are any indication it has become far too easy to commit fraud in the U.S. Check fraud alone cost U.S. banks US$5 billion in 2006, and the CIA believes that at least some of that money was funneled to terrorist organizations or organized crime. Using a conventional DVR, fraud investigators can’t track criminal activity across branches and time, and even if they could, the average branch DVR doesn’t have the storage to keep up with such a search. Because they can’t track a suspect, investigators can’t determine if they’re a one-time offender, a repeat offender, or part of an organized crime ring. All of this adds up to a low percentage of solved cases, and less quality evidence for cases that do get solved, which results in shorter jail sentences and a higher probability of repeat offences. Intelligent video management systems, on the other hand, take an integrated approach to fraud that combines video analysis, such as motion and face recognition, alert functionality, and a variety of investigative tools to provide a multi-pronged fraud-fighting strategy. Detecting and stopping rings like this is a huge step in protecting both the financial institutions involved, and the country. It could also save financial institutions from paying heavy fines for failing to comply with the Department of Homeland Security’s “Know Your Customer,” regulations. Another example of private industry and its effect on national security can be found in the chemical and water industries. Threats of water contamination by terrorists are wide spread, as are threats to the security of various chemical facilities in the U.S., where terrorists could easily sneak in, steal what they need to poison the general public, and wreak havoc. These threats have prompted the Department of Homeland Security to devise new regulations for critical facilities, requiring major improvements to their security surveillance systems. In response, critical facilities are increasingly installing more intelligent systems and sharing information regularly with each other, the federal government, and local law enforcement. In the end, it’s all about information -- getting it, using it, and sharing it. As surveillance systems get better and better at delivering relevant information to investigators, and security organizations are better able to share information with each other and with law enforcement, security will increase, measurable not by the number of cameras on our streets but by the overall safety of our people. Stephen Russell is CEO of 3VR Security, Inc. (http://www.3vr.com/).